The King of Kong: A Fistful of Quarters is a 2007 American documentary film about competitive gaming directed by Seth Gordon. It follows Steve Wiebe in his attempts to take the high score record for the 1981 arcade game Donkey Kong from the previous holder, Billy Mitchell. The film premiered at the 2007 Slamdance Film Festival and was released in U.S. theaters in August 2007. It received positive reviews. Walter Day is the founder of Twin Galaxies, an organization dedicated to tracking high scores in arcade games. Among the high-scoring players is restaurateur Billy Mitchell, who has held the high score for the 1981 game Donkey Kong since 2004. In Redmond, Washington, out-of-work engineer Steve Wiebe has purchased a Donkey Kong cabinet to try to break the record. Using his mathematical knowledge to identify exploitable patterns in the game, Wiebe achieves a new record of 1,006,600 points – the first ever score over a million. He submits a tape to Twin Galaxies, which propels him to local celebrity in the Seattle area. Mitchell and Twin Galaxies send two referees to investigate Wiebe's machine. They learn that the machine's circuit board was provided by Roy Shildt, a self-proclaimed fitness guru and pickup artist who claims the high score for Missile Command. Unbeknownst to Wiebe, Shildt and Mitchell have been at odds for years after Mitchell questioned Shildt's high score, causing Twin Galaxies to disqualify it. Twin Galaxies suspects that Shildt may have tampered with Wiebe's board, and does not recognize Wiebe's record. Wiebe travels to a tournament at Funspot in Laconia, New Hampshire, to attempt a live high score for high-ranking Twin Galaxies members. Wiebe challenges Mitchell to a Donkey Kong competition, but Mitchell does not attend. Before a crowd, Wiebe sets a new high score of 985,600 and reaches the kill screen, ending the game. However, contrary to his statements that videotaped scores carry less validity than scores achieved in public, Mitchell sends a low-quality VHS to Funspot depicting himself achieving a higher score of 1,047,200 points. Twin Galaxies proclaims Mitchell the record holder. Nine months later, Guinness World Records has decided to publish Twin Galaxies' records — including Mitchell's latest score – and hosts a tournament in Mitchell's hometown of Hollywood, Florida. Wiebe again challenges Mitchell to a public competition, but Mitchell refuses. Wiebe fails to surpass the record, but afterward, Day acknowledges Wiebe's integrity and invites him to submit taped scores. At home, Wiebe achieves a new record of 1,049,100 in his garage. Billy Mitchell, described in the film as "the world's best gamer"
Roy Shildt (aka "Mr. Awesome"), Billy Mitchell's "nemesis"
The King of Kong premiered January 22, 2007, at the Slamdance Film Festival and has been shown at the Newport Beach Film Festival, the Seattle International Film Festival, the SXSW Film Festival, the TriBeCa Film Festival, the True/False Film Festival, the Aspen Comedy Festival, and the Fantasia Festival. The film opened in limited release in the United States on August 17, 2007 in five theaters, and by September 9, 2007, it had expanded to 39 theaters. The film's DVD release was on January 29, 2008. On Metacritic, The King of Kong has an average score of 83 out of 100, based on 23 reviews. On Rotten Tomatoes, it has a score of 97% based on 99 reviews. Robert Wilonsky of the Village Voice called the film a "miniature masterpiece" and in August 2007 said it was his favourite film of the year so far. Pete Vonder Haar of Film Threat gave the film five stars and said "It’s not just one of the best documentaries I’ve ever seen, it’s one of the best movies I’ve ever seen". Keith Phipps of The Onion AV Club gave the film an "A-" and said it was "a film about what it takes to make it in America." Peter Travers of Rolling Stone gave the film three out of four stars, writing: "Who would have guessed that a documentary about gamers obsessed with scoring a world record at Donkey Kong would not only be roaringly funny but serve as a metaphor for the decline of Western civilization?" Roger Ebert of the Chicago Sun-Times similarly gave the film three out of four and called it "a documentary that is beyond strange." Critic Richard Roeper stated that the film "deserves an Oscar nomination for Best Documentary" in 2007 on At The Movies. Ann Hornaday of The Washington Post wrote: "Is there anything more tiresome than watching people play video games?" and "The competition is so vicious because the stakes are so low." Stephen Garrett of Time Out New York called it "moderately entertaining and ultimately kind of pathetic" and felt the early-1980s arcade subculture is explored in greater depth in the documentary Chasing Ghosts: Beyond the Arcade. The North Texas Film Critics Association named The King of Kong Best Documentary for 2007. The Boston Society of Film Critics named it the runner-up for Best Documentary Feature of 2007. It was nominated for Best Documentary Feature of 2007 by the Broadcast Film Critics Association. The film was also nominated for Best Documentary Feature by the Chicago Film Critics Association, but lost to Sicko. It appeared on several critics' top ten lists of the best films of 2007. On February 2, 2018, Twin Galaxies member Jeremy Young filed a complaint regarding several of Mitchell's records. The validity of Mitchell's August 7, 2010, high score, set at Boomers-Grand Prix Arcade, could not be determined. The referee who allegedly witnessed and certified the record was gamer Todd Rogers, who appears in The King of Kong, and was himself exposed as having fabricated scores earlier in 2018. On April 12, Twin Galaxies announced that Mitchell had used emulation software to achieve the Donkey Kong high score rather than an arcade machine; this is banned because it allows players to cheat in undetectable ways. Mitchell was stripped of his records and banned from submitting further scores, and Wiebe was recognized as the first person to score over a million points. Footage obtained from the Kong DVD's special features was cited by the investigative committee in their findings as having been instrumental in exposing Mitchell. In 2014, King of Kong: The Musical, which parodied the characters and events depicted in the documentary began its limited run. A scripted film adaptation is also in the works. Director Seth Gordon has said that the movie might be a sequel instead of a remake, telling the story of how the documentary changed both men's lives, as well as their continuing rivalry. ^ "The King of Kong: A Fistful of Quarters". Box Office Mojo. Retrieved 28 February 2012. ^ The King of Kong - Slamdance Film Festival 2007. Slamdance.com. Retrieved 2007-08-26. 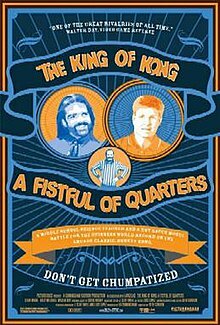 ^ "The King of Kong: A Fistful of Quarters (2007) - Weekend Box Office". Box Office Mojo. Retrieved 2007-09-12. ^ "King of Kong: A Fistful of Quarters, The (2007): Reviews". Metacritic. CBS Interactive. Archived from the original on 2007-08-25. Retrieved 2 October 2016. ^ "The King Of Kong: A Fistful of Quarters". Rotten Tomatoes. Flixster. Retrieved 2008-08-22. ^ Robert Wilonsky (2007-08-14). "Tracking Shots: The King of Kong: A Fistful of Quarters". Village Voice. Retrieved 2007-08-26. ^ "Ebert & Roeper - August 17, 2007 episode". Ebert & Roeper. 2007-08-17. Archived from the original on 2008-11-20. Retrieved 2007-09-12. ^ Pete Vonder Haar (2007-08-18). "THE KING OF KONG". Film Threat. Retrieved 2007-08-26. ^ Keith Phipps (2007-08-17). "The King Of Kong: A Fistful Of Quarters". The Onion AV Club. Retrieved 2007-08-26. ^ Peter Travers (2007-08-07). "The King of Kong : Review : Rolling Stone". Rolling Stone. Retrieved 2007-08-26. ^ Ebert, Roger. "Review: 'THE KING OF KONG: A FISTFUL OF QUARTERS'." Chicago Sun-Times, August 23, 2007. Retrieved: June 29, 2017. ^ "At the Movies- King of Kong: A Fistful of Quarters (2007)". YouTube. 2010-08-10. Retrieved 2013-02-14. ^ Ann Hornaday (2007-08-24). "The King of Kong: A Fistful of Quarters". The Washington Post. Retrieved 2007-08-26. ^ Stephen Garrett (August 16–22, 2007). "The King of Kong: A Fistful of Quarters". Time Out New York Issue 620. Archived from the original on 2013-01-16. Retrieved 2007-08-26. ^ Meyer, John P. (January 17, 2008). "North Texas Film Critics Association picks the best of 2007". Pegasus News. Dallas, TX. Retrieved December 21, 2012. ^ a b c "Metacritic: 2007 Film Awards & Nominations". Metacritic. Archived from the original on 2007-12-31. Retrieved January 8, 2008. ^ "Metacritic: 2007 Film Critic Top Ten Lists". Metacritic. Archived from the original on 2008-02-23. Retrieved 2008-02-25. ^ Alexandra, Heather (February 7, 2018). "Billy Mitchell Breaks Silence About Donkey Kong High Score Controversy". Kotaku. ^ Orland, Kyle (February 8, 2018). "King of Kong star says 'original tape' will prove his disputed scores". Ars Technica. ^ Crecente, Brian (April 12, 2018). "Famed Donkey Kong Player Stripped of Title". Variety. ^ "King of Kong the Musical". www.kingofkongthemusical.com. Retrieved 26 January 2018. ^ 'King of Kong' Movie Might Be a Sequel? Nathan Fillion vs Johnny Depp? JustPressPlay. August 27, 2007. Retrieved April 13, 2018. Country 3: Dixie Kong's Double Trouble! This page was last edited on 10 April 2019, at 07:51 (UTC).